I'm officially writing for Season 5 of truTV's Impractical Jokers! Join me on Monday for Staff Infection at the PIT in NYC. The writers and producers of Impractical Jokers will be showcasing their talents in a variety show of stand up, video and improv! 8 PM Monday, November 2nd at The PIT, 123 E 24th Street, NYC. Use promo code "HALFINFECTION" for $5 tickets. 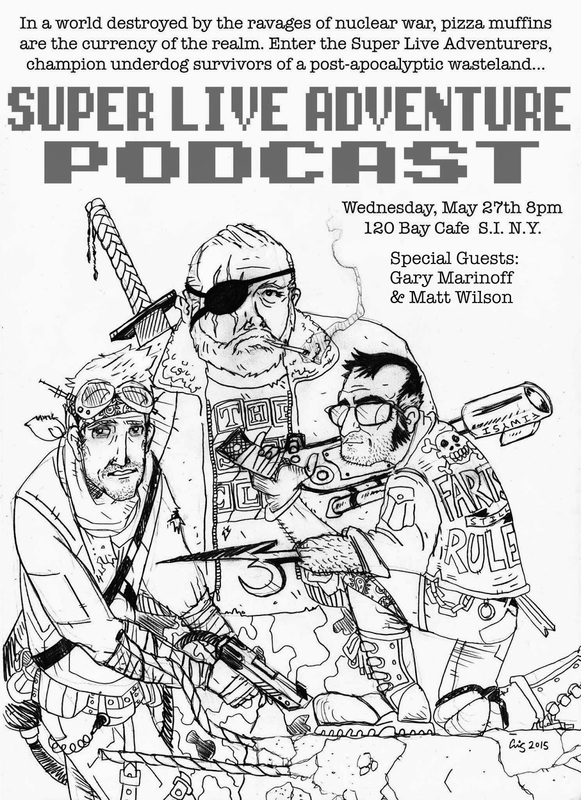 The New York Super Week episode of the Super Live Adventure Podcast is now online! I want to thank Desmin Borges of FXX's You're the Worst for hanging out with us for this one. 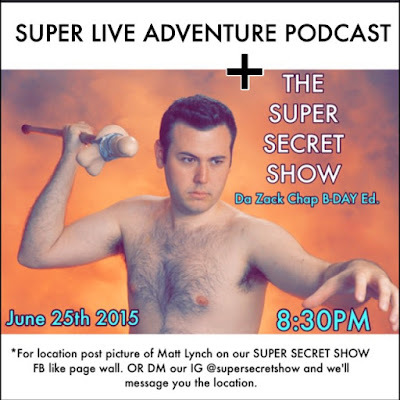 Subscribe to the Super Live Adventure Podcast on iTunes and listen to free episodes every Monday! 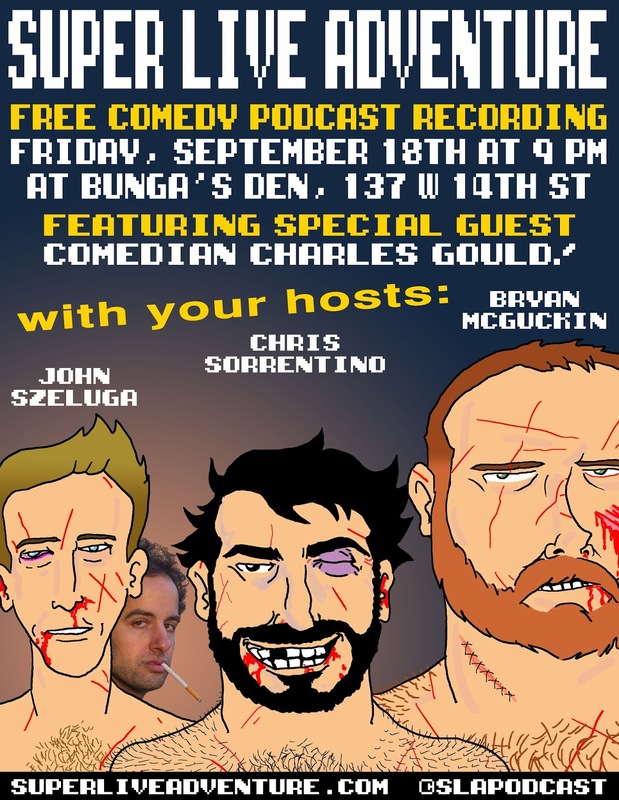 SLAP Live Recording at Bunga's Den with Comedian Sue Smith! Check out Sue's new EP on Amazon and listen to past episodes of the Super Live Adventure Podcast on iTunes and Stitcher. Jess and the guys also discuss John's awkward visit to the dermatologist, Kurt Cobain's death, Lone Wolf and Cub, and more! Listen using the free Podcast Source App for bonus audio content and downloadable wallpaper. Episode 48! Hosts Bryan McGuckin, Chris Sorrentino and John Szeluga share a few drinks while discussing birthdays, the recent leap second, Top Gear, riding the bus, Dr. Strange, Bud-blood, being short, the Heimlich Maneuver, Breakfast at Tiffany's, The A-Team, the Ghostbusters reboot, women in film, The Day the Clown Cried, Barbara Walters' interview with the Teenage Mutant Ninja Turtles, Sesame Street, Steampipe Alley, vintage toys, Big Trouble in Little China, Ric Flair, Fair Game (1995), Sharon Stone, Spider-Man, and more! Download this episode. 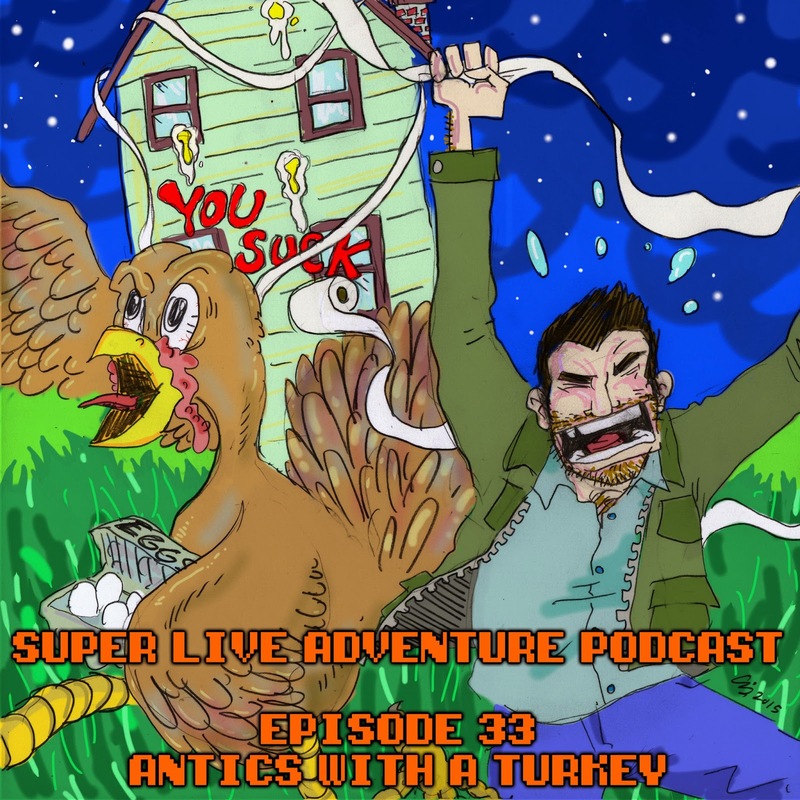 Find more episodes of the Super Live Adventure Podcast on iTunes, Stitcher and SuperLiveAdventure.com. Tickets for our October 6th New York Super Week are only $5. Get them before they run out! Visit newyorksuperweek.com for more information. FREE COMEDY SHOWS THIS WEEK! SUBMIT TO THE "BAD WRITING” CONTEST! Bring 150 WORDS (MAX) of "awful" prose, "terrible" plays, or "garbage" poems to read on stage. The worst writer wins $10! 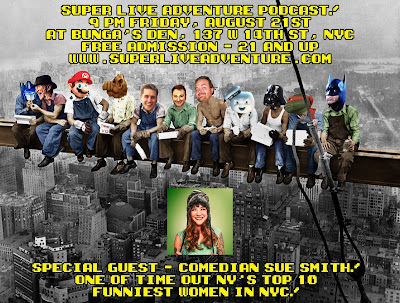 Tim Duffy (Mid-Evenings), Lukas Kaiser (Spike TV), Sue Smith (Best Week Ever), and John Szeluga (Super Live Adventure Podcast) present Amazingtown Comedy – a free weekly comedy show at Bunga's Den - 137 W. 14th Street in Manhattan. 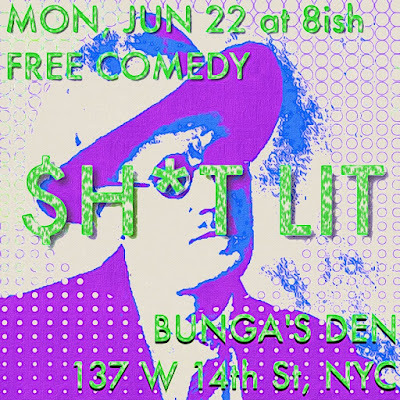 Come see some of NYC's best comedians at a fun bar with great drink specials. Show up early to throw your name in the bucket for a chance to win FREE DRINKS! Plus happy hour drink specials and a free open mic! Come be a part of the live audience as John Szeluga, Chris Sorrentino and Bryan McGuckin are joined by comedian Justin Perez! Stick around after the podcast for some of NYC's best stand-up comedy! I'm going to Los Angeles for a few days, so I'm being replaced. 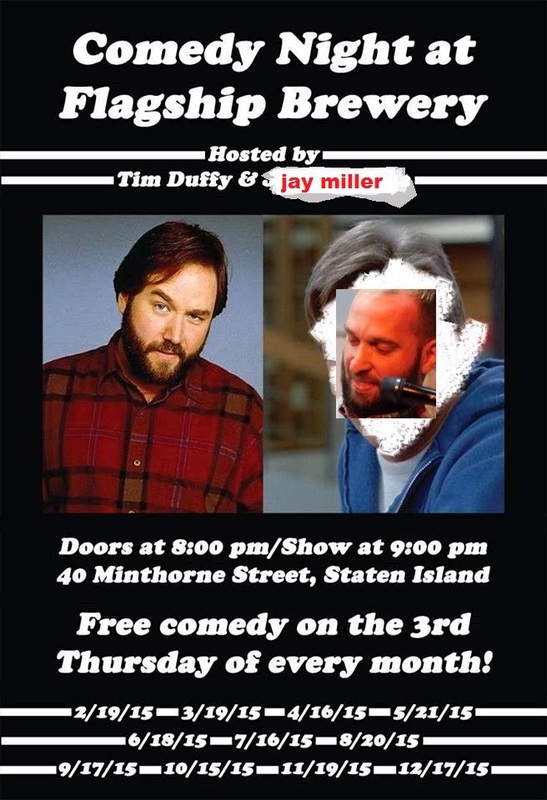 Go to Flagship Brewery on Staten Island Thursday night, April 16th to see two great shows happening without me! 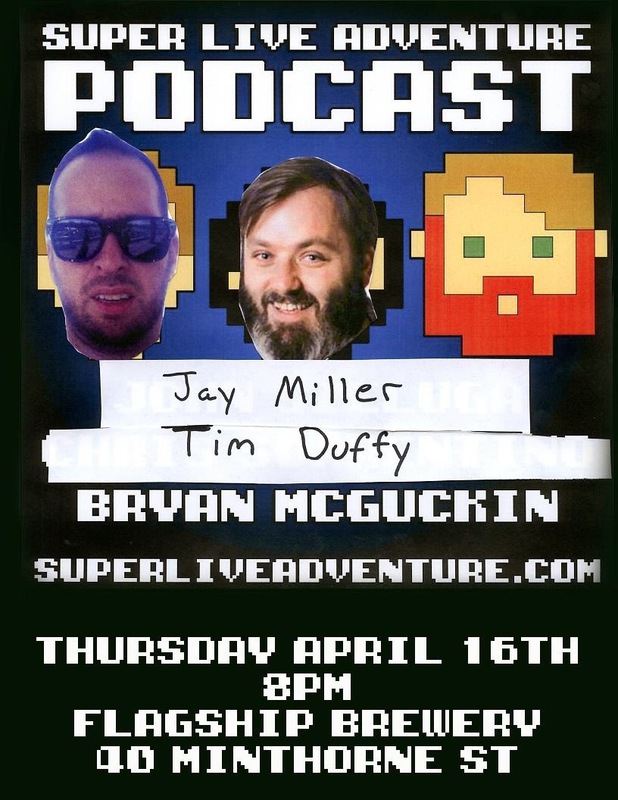 At 8:00 PM, Tim Duffy and Jay Miller will be replacing Chris Sorrentino and myself for a special edition of The Super Live Adventure Podcast with Bryan McGuckin. 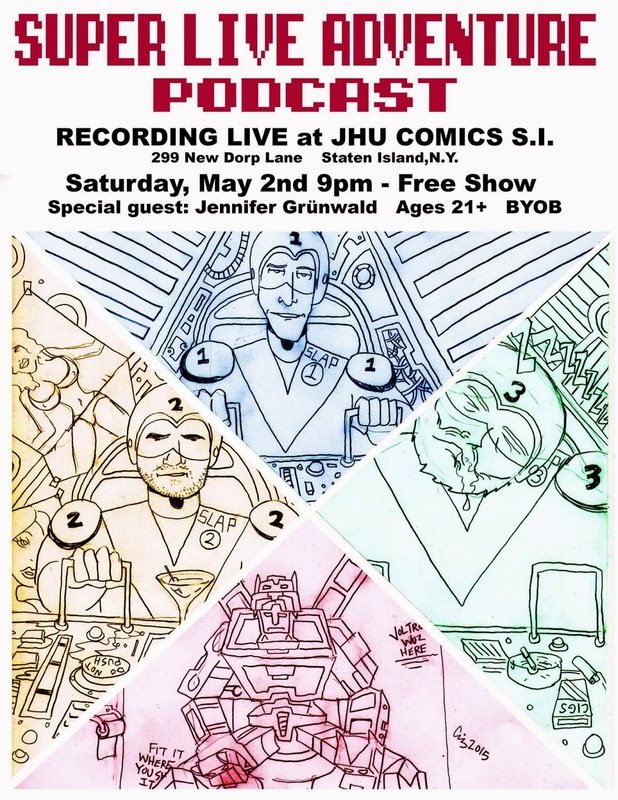 This episode was recorded in front of a live audience at JHU Comic Books on Staten Island. 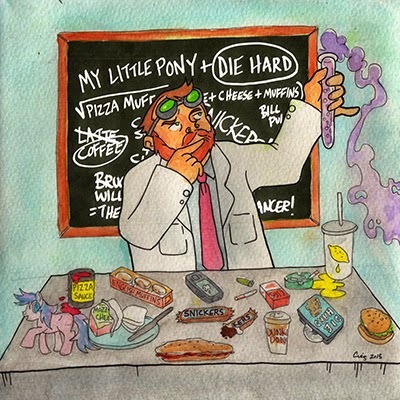 Theme song created by Ezra Donellan. SLAP App users receive additional audio and downloadable wallpaper. 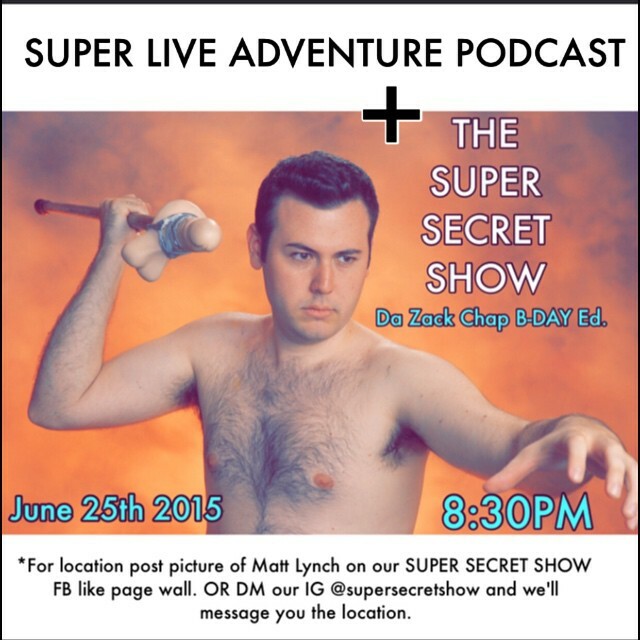 Available on iTunes, Stitcher and www.SuperLiveAdventure.com.